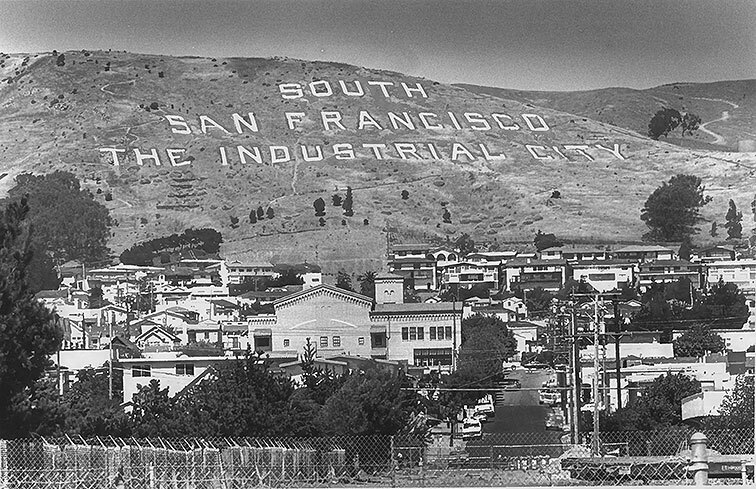 In a 1928 special election, South San Francisco voters approved a property tax raise to fund the construction of huge concrete letters on the side of the San Bruno Mountains proclaiming, “SOUTH SAN FRANCISCO THE INDUSTRIAL CITY.” The Chamber of Commerce-proposed sign was intended to attract businesses and homeowners to San Francisco’s industrial suburb. Many forms of industry have thrived in South San Francisco from the 19th century into the 21st, and public pride for the hillside sign’s city-boostering message has generally held strong too. At the same time, the sign simplifies the human stories behind the city’s industry and how the meaning of “industry” has changed over time. South San Francisco hillside sign in 1987. Driving north on Highway 101 along the San Francisco Bay, it’s difficult to miss the enormous message pasted onto the south side of the San Bruno Mountains: white concrete block letters that proclaim in all caps, “SOUTH SAN FRANCISCO THE INDUSTRIAL CITY.” For many commuters and passersby, a glimpse of this sign is the deepest connection they’ll ever have with South San Francisco, and perhaps they won’t even realize that it’s a separate municipality from San Francisco itself—a confusion that has annoyed members of the South San Francisco community from its early years, and which this very sign was built to rectify. The sheer size of the sign (each letter ranges from 48 to 65 feet tall) conveys a heft and sense of long-lastingness (Continuation Sheet: South San Francisco Hillside Sign, Section 7 pdf). 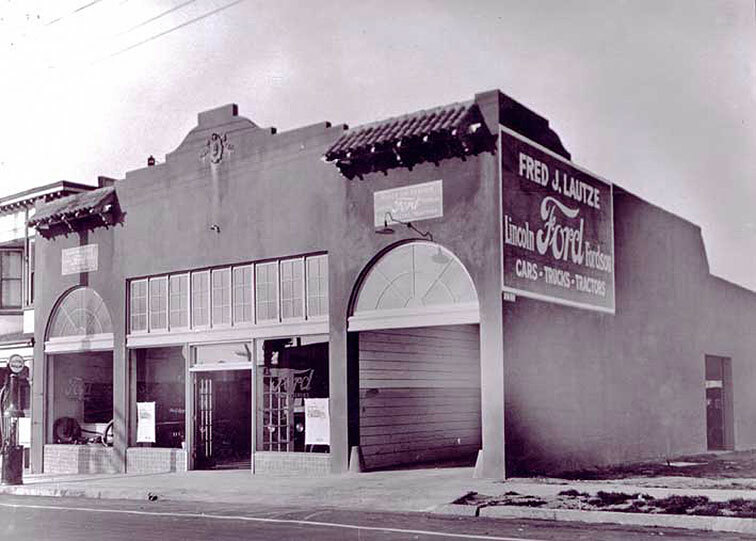 So perhaps it is not difficult to imagine a Ford automobile dealer back in the 1930s named Fred Lautze, whose business had been decimated by the Great Depression, towing a car along Grand Avenue to make some money and looking up at the same sign (“Life in the 1930’s” 1). One can imagine how ironic this brash sign might have felt to this man who had lost most of his work; while the city’s many factories survived the Depression, not every individual thrived through this period. 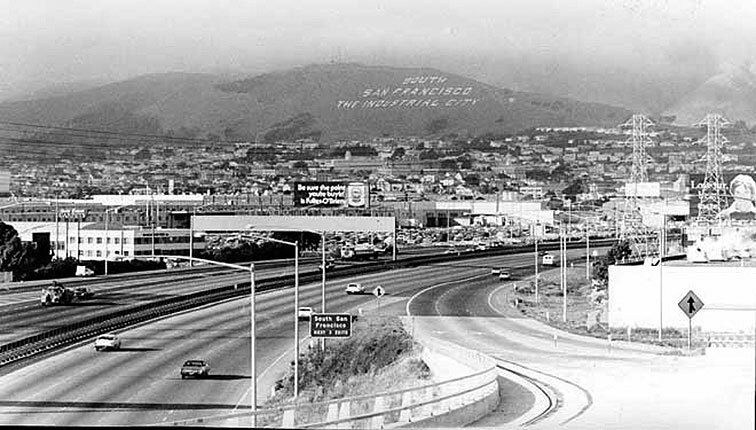 The hillside sign’s long history provides a lens through which we can consider how South San Francisco has changed over time and how the proud presentation of industry as a city’s face has a more complicated push and pull of human interests behind it. Grand Avenue in South San Francisco, 1893. 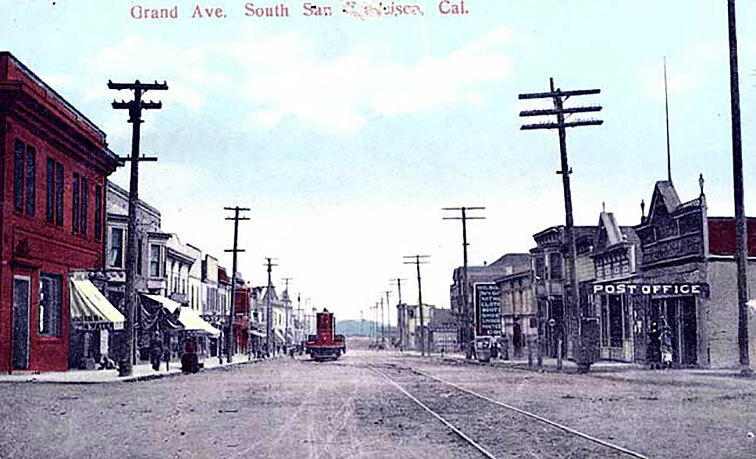 Grand Avenue in South San Francisco, early 1900s. 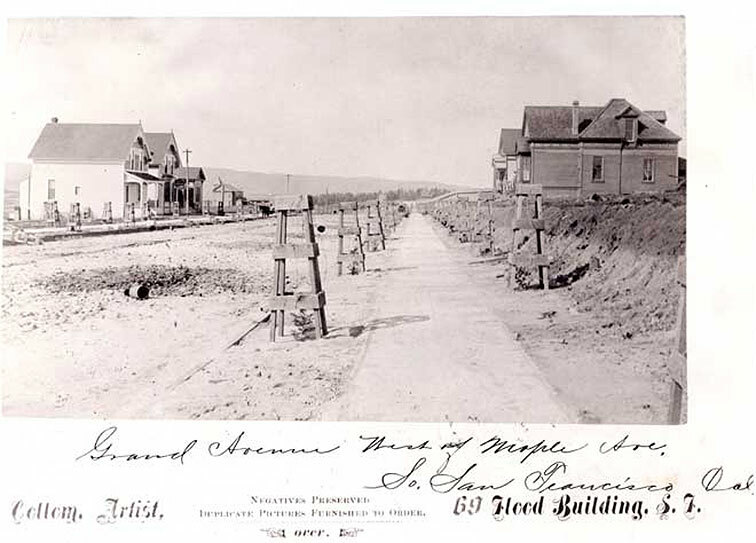 In the 1880s, Frank Tucker moved from Portland Oregon to work as a carpenter in a town called Baden (soon to be renamed South San Francisco), which he described as “a sure frontier town if there ever was one. Saloons, gambling, cow boys, dancing and a plenty of gunmen” (Tucker). But it wouldn’t stay that way for long. Soon, Tucker encountered a strange man from out of town, and after sharing several games of horseshoes together and some drinks, he discovered the man was a representative of the Merriam Cammet Company, a cement company from Chicago. Tucker sold the man some land, and began capitalizing on the wave of industry coming to South San Francisco. 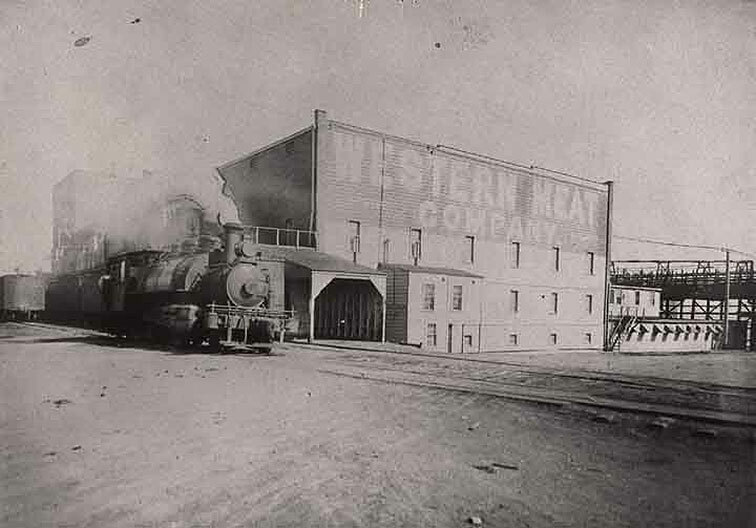 By 1892, the Merriam Cammet Company had established itself in the community and was advertising a “Grand Xcursion over the new bay shore line to the GREAT STOCK YARDS at the New Town of SOUTH SAN FRANCISCO, San Mateo County. Every Saturday and Sunday” in the San Francisco Call. Already, the city’s industry was being presented as an exciting draw for people. 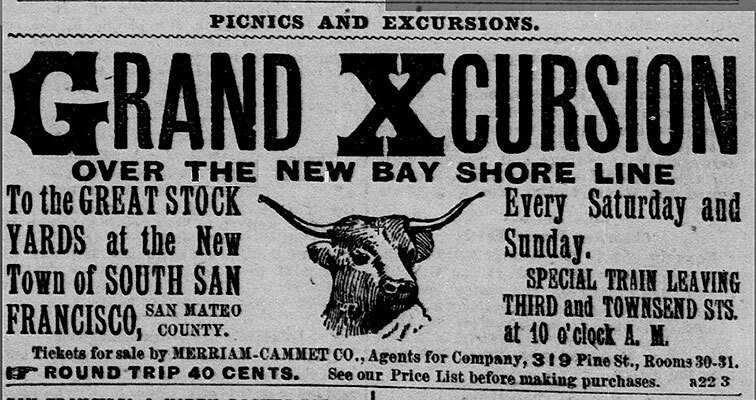 Advertisement in the San Francisco Call, April 23, 1892: industry as an attraction. Tucker lost all the money he earned as a minor real estate mogul in the Panic of 1893 (Tucker), but heavy industry kept on in South San Francisco (also known as South City), and began to grow even more at the start of the 20th century. This growth was led by the meatpacking industry, particularly G. F. Swift’s Western Meat Company (Continuation Sheet, Section 8, 1). Swift envisioned developing South San Francisco into an industrial suburb modeled on South Chicago and South Omaha; he could hire labor from San Francisco and sell his products there. The damage of the 1906 earthquake to San Francisco’s Butchertown district—confusingly also referred to as “South San Francisco”—aided the growth of this new, proper South San Francisco as a local source of meat (Walker); the completion of the Bayshore Railway Cutoff in 1907 also made transportation and commerce between the two towns especially easy (Continuation Sheet, Section 8, 2).Yet the suburb was still undeveloped enough that Swift and other business owners could buy up large amounts of cheap land and have huge influence on local policies: two of the city’s first four mayors after its incorporation in 1908 were associated with Western Meat; another had worked for the Southern Pacific Railway (Walker). 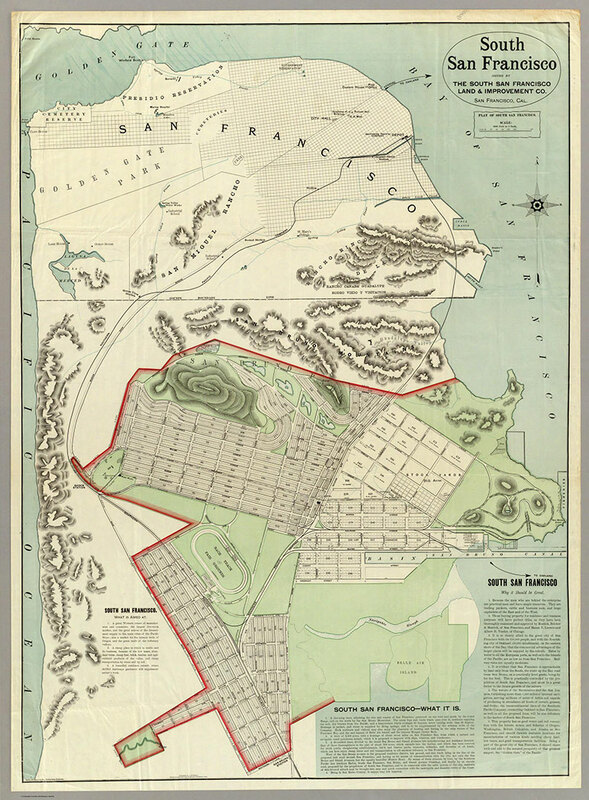 An 1890 map by the South San Francisco Land & Improvement Co. emphasizes another key selling point for both business and new residents: being in San Mateo County, the city had lower tax rates than San Francisco (South San Francisco Land & Improvement Co.). Ironically, San Mateo County’s role as home of many wealthy capitalists’ estates also eventually slowed industrial expansion southward, pushing most of the growth of industry toward the East Bay instead (Walker). 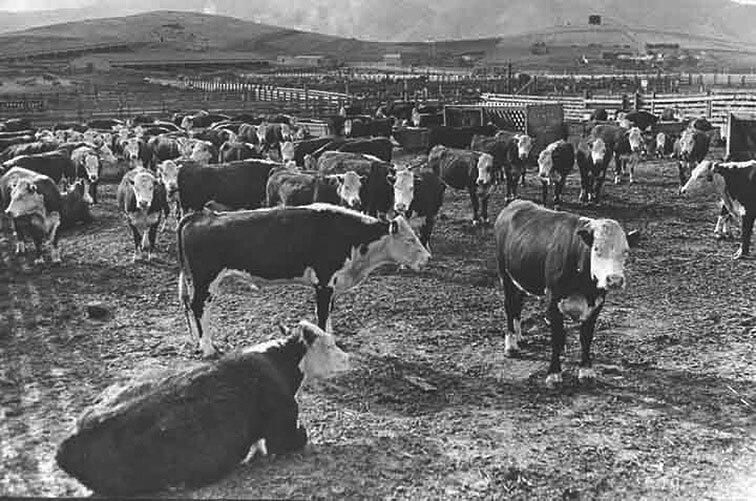 Western Meat Company plant, Grand Avenue, South San Francisco, early 1900s: the impersonal view. 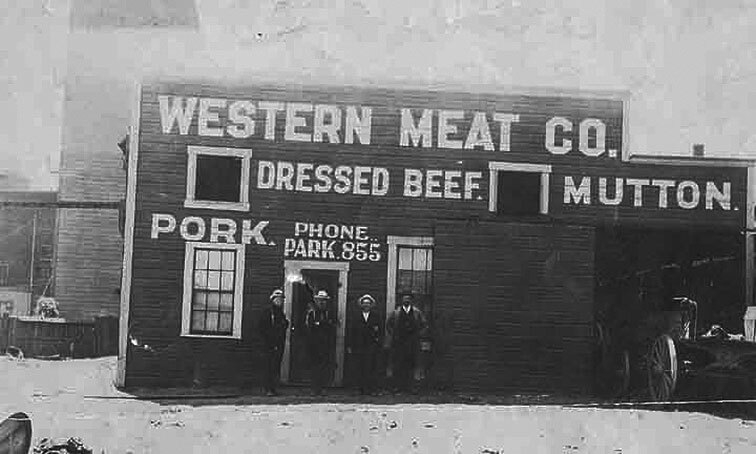 Western Meat Company plant, Grand Avenue, South San Francisco, early 1900s: the human side. 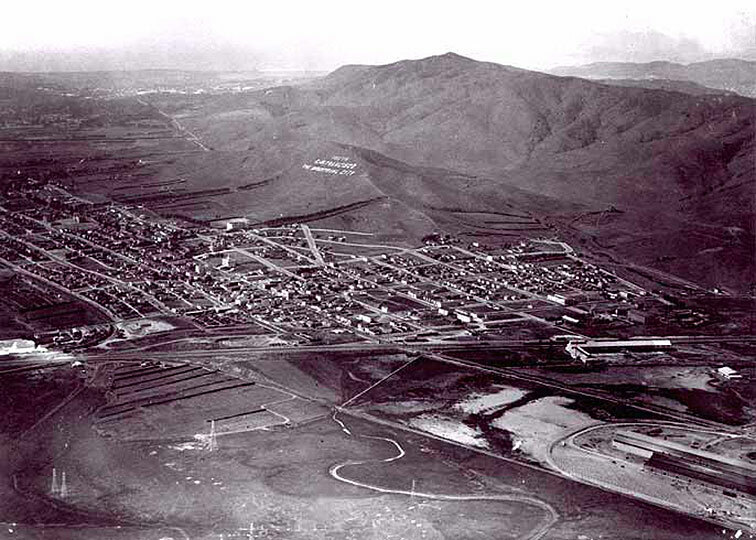 Nevertheless, South San Franciscans pushed to remain a bastion of heavy industry throughout the first half of the 20th century—it was in fact conflict over a new smelting facility supported by locals but opposed by the county that led the town to incorporate in 1908 (National Register of Historic Places, Section 8, 2). In 1923, the city’s Chamber of Commerce built a whitewashed version of the sign that exists today to promote the city (Continuation Sheet, Section 8, 2). It was a form of boosterism that provides an interesting foil to the City Beautiful-inspired display of the Panama-Pacific International Exposition that had seized its northern neighbor just a few years prior, as well as the famous Hollywoodland sign (the “land” has since been removed) also built in 1923 to promote a luxury housing development in Los Angeles (Meares). The South San Francisco sign cultivated an image not of high culture or luxury, but of a paradise for companies looking to build new factories and people looking for work. Residents’ feelings about the image conveyed through this sign was mixed. By 1928, the sign had fallen apart somewhat, and the Chamber of Commerce proposed a new tax to fund a concrete version (Continuation Sheet, Section 8, 3). Many prominent community members and groups—from the Women’s Club to the local pastor—supported the tax; nevertheless, the ballot proposition to enact it failed to win the two-thirds majority from voters that it required to pass. It was only after a persistent Chamber of Commerce called for a second special election later that year, specifically for the sign, and campaigned aggressively for it, that two-thirds of voters approved it. Completed on May 15, 1929, that concrete sign is the one that exists to this day (Continuation Sheet, Section 8, 4). South San Francisco, including hillside sign, 1930. Fred Lautze’s Ford dealership, 1925: despite the survival of industry in South San Francisco, not everyone did well through the Depression. Although it survives, the sign and what it represents have seen numerous ups and downs over the past century. South San Francisco’s industry remained relatively strong in the Great Depression (though the simple survival of companies through the era obscures the layoffs they made and the stories of people like Fred Lautze, the car dealer) (“Life in the 1930’s”), and in 1932, a second electric sign was constructed nearby: this one alternated between displaying the “South San Francisco The Industrial City” message and advertisements like “Maxwell House Coffee – Good to the Last Drop” (Continuation Sheet, Section 8, 4-5).This electric sign was removed in 1939, due to fears that its lights could be used to target the nearby airport during a potential air attack at night (Continuation Sheet, Section 8, 5). Industry continued to thrive throughout World War II, with particular growth in shipbuilding and other wartime necessities (Continuation Sheet, Section 8, 6), but in the postwar period, as heavy industry’s role in the country’s economy declined, different companies began to take root in South San Francisco: for example, See’s Candies, Toshiba, and especially Genentech (Simon), which dubbed the city “the birthplace of biotechnology” and started a boom in that industry (Pellissier). These companies take advantage of South San Francisco’s proximity to San Francisco and its relative cheapness, just like the industries of the late 19th century did. Genentech, in particular, has gone to great lengths to minimize the property taxes it pays (Bishop)]. With the move to these new kinds of businesses, some residents have disdained the “Industrial City” slogan; when the hillside sign was designated a historic resource in 1986, some spoke against it, wanting instead to tear down the sign or change it to read “The Industrious City” (Simon). Ultimately, however, 1,300 citizens signed petitions in support of the sign (Continuation Sheet, Section 8, 7), and in 1996 it was added to the National Register of Historical Places (Continuation Sheet). While the sign continues to use “industry” as a promotional slogan, it’s important to remember the human labor behind that word. From Frank Tucker’s rapid financial rise and fall in the 19th century, to the struggles of workers and small business owners like Fred Lautze in the Great Depression, to the fight over the continued existence of the sign in the 1980s—one cannot just accept “the industrial city” as a simple description of utopia. We can consider, too, the human labor behind the sign itself: back when the whitewashed sign was built in 1923, high school boys were paid 40 cents an hour to remove overgrowth from the sign and repaint it regularly (Continuation Sheet, Section 8, 3). By the early 21st century, in a sinister sort of mirroring, these same tasks were being done by teenagers from San Mateo Juvenile Protection (Pellissier). But lighter human stories touch the sign as well. The S’s and C’s have been painted red and blue for football games between Stanford and the University of California (“Sign Hill” 2); “S” and “F” have been painted orange in honor of the Giants (Pellissier); and locals have been known to slide down the huge letters for fun (Pellissier). Heavy or light, there’s more to the South San Francisco sign than the monolithic image it tries to convey. South San Francisco sign from Bayshore Highway (Highway 101), 1950s. Bishop, Shaun. “Genentech, county still at odds over property tax assessment.” The San Francisco Examiner. The San Francisco Examiner, 2011. Web. 20 Mar. 2017. “Continuation Sheet: South San Francisco Hillside Sign.” pdf. National Register of Historic Places. National Park Service, 1996. Web. 20 Mar. 2017. “Life in the 1930’s.” City of South San Francisco. South San Francisco Public Library and South San Francisco Historical Society, n.d. Web. 20 Mar. 2017. Meares, Hadley. “Behind the Sign: The Lost Meanings of the Original Hollywood Sign.” KCET. KCETLink Media Group, 2014. Web. 20 Mar. 2017. Pellissier, Hank. “Sign Hill.” The New York Times. The New York Times, 2010. Web. 20 Mar. 2017. San Francisco Call, Volume 71, Number 144. 2. California Digital Newspaper Collection. The San Francisco Call, 1892. Web. 20 Mar. 2017. “Sign Hill.” City of South San Francisco. South San Francisco Public Library and South San Francisco Historical Society, n.d. Web. 20 Mar. 2017. Simon, Mark. “South S.F. Sign Wins Status / Famous hillside slogan to be historic landmark.” SFGate. The San Francisco Chronicle, 1996. Web. 20 Mar. 2017. South San Francisco Land & Improvement Co. “South San Francisco.” David Rumsey Historical Map Collection. Rand McNally, 1890. Web. 20 Mar. 2017. Tucker, Frank. “The Life of The Wanderer.” FoundSF. Shaping San Francisco, 1930. Web. 20 Mar. 2017. Walker, Richard. “Industry Builds Out the City: The Suburbanization of Manufacturing in San Francisco, 1850-1940.” FoundSF. Shaping San Francisco, 2005. Web. 20 Mar. 2017.